Liverpool head to Goodison Park on Saturday to face local rivals Everton in the Merseyside derby on Saturday's lunchtime kick-off. Who will claim the bragging rights? Find below our Everton vs Liverpool betting preview with predictions, betting tips, probable lineups, team news, highest odds, betting promotions and no deposit free bets on this weekend's matches! Everton suffered a bruising 3-1 defeat against Manchester City last weekend after surrendering over 80 percent of the ball. They are languishing in 9th spot in the Premier League table. Anyway, Sam Allardyce's men have won three of their last four games at Goodison Park. 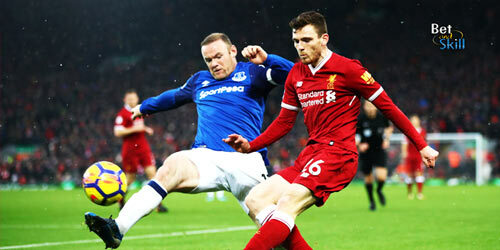 The Toffees have a terrible recent record in the Merseyside Derby, having failed to get the better of the Reds in the last 16 matches between the rivals. In the most recent direct encounters, these clubs played to a 1-1 draw at Anfield as Mohamed Salah and Wayne Rooney traded goals back in December, then the Toffees suffered a 2-1 defeat at the same venue in the FA Cup in January. Idrissa Gueye should be okay to start here with an extra week's recovery under his belt. Tom Davies could also return in centre midfield, potentially leaving Wayne Rooney and Morgan Schneiderlin battling it out for one spot in either a 4-2-3-1 or 4-3-3 system. Up front, Cenk Tosun is likely to play as central striker, with Yannick Bolasie and Theo Walcott expect to play out wide. No changes are expected in defense where Michael Keane and Phil Jagielka should be paired at the heart of the back, with Leighton Baines and Seamus Coleman as full backs. Ashley Williams is available after serving a three-match suspension following his red card against Burnley last month. The likes of Mason Holgate, Eliaquim Mangala, Gylfi Sigurdsson, Maarten Stekelenburg and James McCarthy are all missing through injury. Liverpool come into the game on the crest of a wave having demolished Manchester City 3-0 in the first leg of the Champions League quarter-final. Prior to that, Jurgen Klopp's men recorded back to back victories in Premier League having beaten 5-0 Watford at home and 1-2 Crystal Palace at Selhurst Park. The Reds currently find themselves in third place in the Premier League standings, two points clear of fourth-placed Tottenham who have a game in hand. They have lost just twice in the last 23 Premier League outings. As to recent Merseyside derbies, four of the last five Premier League fixtures at Goodison Park have actually ended in draws, although Liverpool were able to claim a 1-0 win in the contest last season. Mohamed Salah remains a doubt for the Merseyside derby after being forced off with a groin problem in the 3-0 win over Manchester City in the UEFA Champions League. As a result, Jurgen Klopp is could hand Alex Oxlade-Chamberlain a role on the right of the front three, with Roberto Firmino and Sadio Manè retaining their berth. With Joel Matip, Ragnar Klavan and Joe Gomez sidelined for the Reds, the German managers has no choice but to continue with Dejan Lovren and Virgil Van Dijk at the back. Alberto Moreno could benefit with a start if Klopp wants to keep Andrew Robertson fresh for the return match against Man City. In midfield, Jordan Henderson is expected to be flanked by Georginjo Wijnaldum and one between Oxlade-Chamberlain and Milner (depending if Salah will be fit or not). Adam Lallana is still sidelined. Get 25/1 Liverpool to win the Merseyside Derby with Betfair! New Customers can get Liverpool at an enhanced 25/1 to beat Everton. Max Stake £1. Winnings paid in free bets, valid for 7 days, only deposits with cards/Paypal count. Exchange and multiple bets excluded. T&C’s Apply. 18+|Gamble Aware. Here at BetAndSkill we strive to provide our readers with the best odds on all the match we preview, one of the most important thing in sports betting. This sections contains the highest prices on the Everton vs Liverpool match winner market! Don't miss our today's football tips! We also suggest you to read our bookmakers' odds comparison report. Get 25/1 Liverpool to win the Merseyside Derby with Paddy Power! Customers can get Liverpool at an enhanced 25/1 to beat Everton. Max Stake £1. Winnings paid in free bets, valid for 7 days, only deposits with cards/Paypal count. Exchange and multiple bets excluded. T&C’s Apply. 18+|Gamble Aware. BetAndSkill's professional tipsters have analysed all the relevant factors related to this match and these are our recommended bets on the Merseyside Derby! Feel free to copy them! We have already found the best odds avalable for every tip. Please visit also our today's enhanced odds section in order to get the latest betting offers! Are you looking for other Premier League match previews? Take a look at our brand new Premier League betting tips section! "Everton vs Liverpool predictions, betting tips, lineups and odds (Premier League - 7.4.2018)"